Chicken Soup For the Soul For Diabetics. You may wonder why this soup is called Chicken soup for the Soul for diabetics, when it does not contain chicken, however it is a hearty warming soup good for the soul. Leo called it chicken soup for the Soul because he grew up in an orthodox Jewish area eating chicken soup. The Jewish people call this recipe Jewish penicillin, and although it is lovely and I still make it once a year it’s not the healthiest soup in the world. The recipe given below is actually Dr Cabot’s recipe for cleansing the liver. As both of us have a fully functioning liver we have never needed to adhere to it 100%. From the first day I saw it I thought what a lovely fresh cleansing soup which is also warming and hearty fabulously healthy. I just pour cold water in a big pan I don’t measure it, I add a couple of handfuls of whatever lentils I have to hand, red, yellow, or green,I add a handful of pearl barley if it’s really cold. I Cook this for about 20 minutes, or as it sticks to the bottom of the pan you can chuck the whole lot in the microwave and cook on half power for about half an hour and add to the soup at the last minute. I then add a large can of tomatoes, may be a few sweet potatoes usually I just use carrots and butternut squash, about four stalks of celery with the tops, several onions, one large thumb sized piece of ginger and cook until soft. You can add any other root vegetable turnips, swedes or rutabaga. Because they don’t measure anything and use different vegetables every time soup is different every time. Sometimes I add miso, sometimes tamari sometimes garlic,sometimes a Knorr stock cube. When all this soup is cooked I add some cooked meat, this can be chicken, beef, pork or lamb, sometimes home-made sausages,sometimes a mixture of all of them. Of course you can add any bones to this soup is well. sometimes I don’t have any meat at all we just have the vegetarian variety, other times I add a tin of mackerel. It really doesn’t matter what you add protein wise as long as it is not smoked sausages or frankfurters. This is my staple dinner three times a week in winter, it’s warm hearty filling comforting and above all healthy. It tastes even better on the second day. Diabetics can try my soup or the one below and know that they can have two big bowls if they want and still stick to the diabetic food plan. As you can see Chicken soup for the Soul is easy and varied it can be changed for the seasons. It makes a great soup for lunch and dinner or a snack – I have even eaten it for breakfast but it is a great diabetic meal. If I don’t add meat I add a second type of bean such as chickpeas, fava beans, kidney beans, white beans, Tuscan beans, black beans and kind of bean or even a mixture. To be brutally honest my chicken soup for the soul vegetarian variety uses the first beans that fall out of my larder. As I said Leo named the soup because it reminded him of school dinners and Jewish food because it is delicious not because it contains chicken. ENJOY. In a large saucepan add the oil and bring to a moderate – high heat. Add the celery (plus tops), ginger root, tumeric, tomato, potato, carrots, beets, onions, celery seed and garlic and some pepper. Stir continuously so the vegetables do not stick to the bottom. When the vegetables begin to brown carefully add the water and bring to the boil. 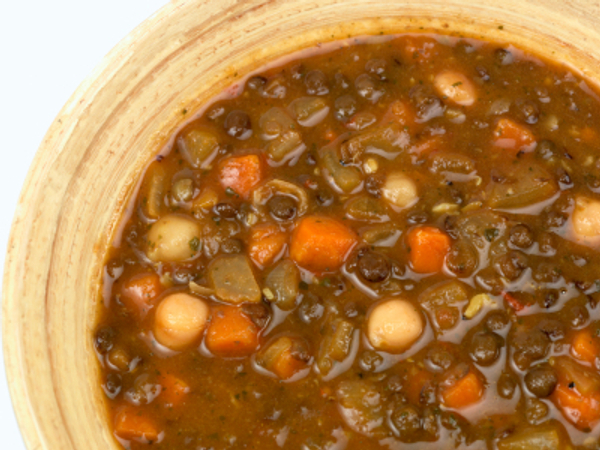 Add the seaweed, mushrooms, artichoke hearts, lentils/beans and stir, then simmer for about 2½ hours. Add the kale and beet greens 15 minutes before you serve. Stir in the miso/tamari to taste. Serve alone or with crusty bread and a side salad.